Cambridge, MA – Soft Robotics Inc, which has built a fundamentally new class of robotic grippers, announced the release of its expanded and upgraded Soft Robotics Development Kit; SRDK 2.0. Where the SRDK 1.0 included 5 four accordion actuator modules and the opportunity to create a gripper containing two to five actuators, The SRDK 2.0 contains 6 four accordion actuator modules plus the addition of a six position hub allowing users the ability to configure six actuator test tools. This expands use of the Development Kit to larger product applications, such as: large bagged and pouched items, IV bags, bags of nuts, bread and other food items. SRDK 2.0 also contains an upgraded Soft Robotics Control Unit (SRCU G2) – the proprietary system that controls all software and hardware with one turnkey pneumatic operation. The upgraded SRCU features new software with a cleaner, user friendly interface and an IP65 rating. Highly intuitive, the software is able to store up to eight grip profiles and allows for very precise adjustments to actuation and vacuum. Also new with the release of SRDK 2.0, is the introduction of several accessory kits that will allow for an expanded number of configurations and product applications available for testing. The shorter 2 and 3 accordion actuators provide increased stability for high-speed applications, increased placement precision, higher grip force capabilities and are optimized for gripping small, shallow objects. 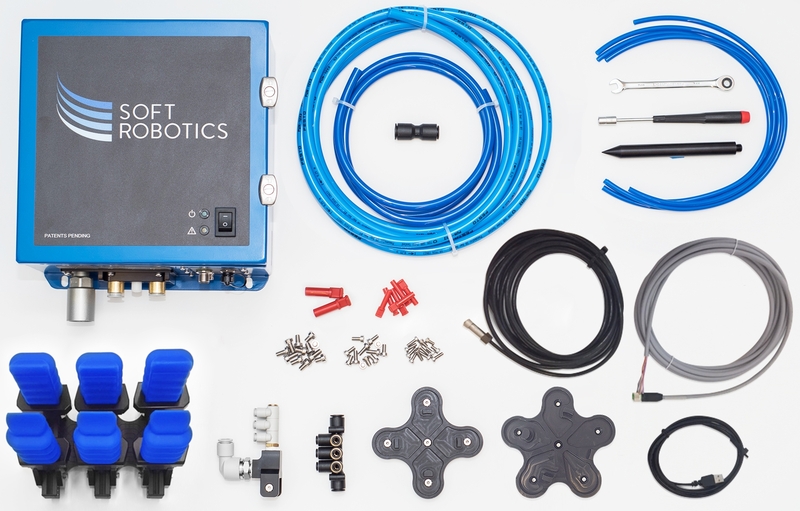 Designed to plug and play with any existing robot currently in the market, the Soft Robotics Development Kit 2.0 allows end-users and OEM Integrators the ability to customize, test and validate their ideal Soft Robotics solution, with their own equipment, in their own environment. Once an ideal solution has been found, the Soft Robotics team will take those exact specifications and build a production-grade tool for implementation into the manufacturing line. And, it doesn’t end there. Created to be fully reusable, the process – configure, test, validate, build, production – can start over again as many times as needed. See the new SRDK 2.0 on display for the first time at PACK EXPO Las Vegas, September 25 – 27, 2017 in Soft Robotics booth S-5925. Learn more about the Soft Robotics Development Kit at www.softroboticsinc.com/srdk.